Provenance makes high-quality homeware products from recycled, reclaimed and renewable materials. As the packaging has to sell the story of the materials as much as the product, the brand language ‘this is now’ and ‘this was’ is used on the face and reverse of each product’s packaging, to introduce the story of its provenance. In keeping with the products, the packaging is designed to achieve high shelf and low environmental impact. Strong orange is used for the boxes to draw attention to the display, the corrugated board for these boxes is 100% recycled (100% post-consumer waste), and is left unbranded to encourage reuse (but can be easily recycled). It is self-coloured to make any in-store damage less visible, reducing the need for re-boxing. Branding is restricted to the paper sleeves, which are made from 80% recycled paper (80% post consumer waste with 20% eco-pulp from FSC-certified sources), with minimal ink coverage and no foil blocking to ensure they can be readily recycled. Sleeves minimize waste when adapting packaging to different languages. Where products are boxed, the sleeve carries a simple line drawing to identify the contents instead of photography for a cleaner aesthetic, as the retailer will always display the physical products. Where possible, cut-outs frame the material of each product, drawing attention to it as much as to the completed product, which should only be one form the material takes in a wider journey of recycling. 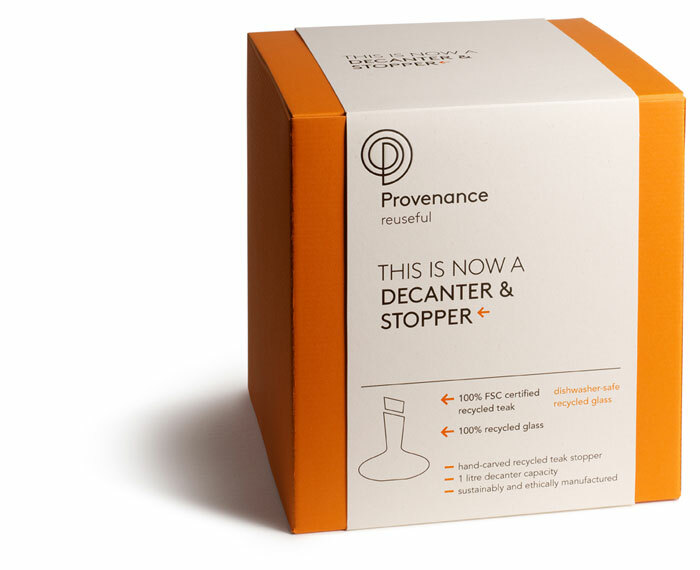 Like the products themselves, all Provenance packaging is made from materials that are 100% recyclable.